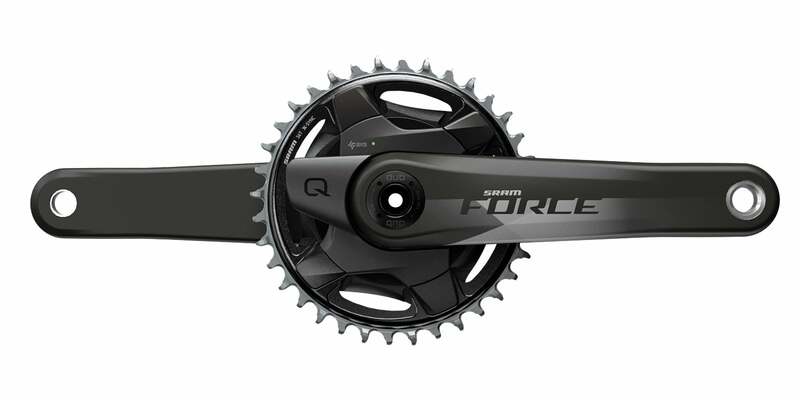 SRAM Force eTap AXS takes on Shimano Ultegra Di2 SRAM's new second tier electronic group delivers all the 12speed function of RED eTap AXS for significantly less. What was the biggest news we learned when SRAM launched new REDa eTap AXS last month? 12speeds? Nope. Wider gear ranges? Nope. Customization? Nope. It was five simple words, ‘Force eTap launches in April’. Even without any details, we knew this was big. If things go to plan for SRAM, more riders will experience electronic eTap AXS 12speed shifting and all it can do with the more price friendly SRAM Force eTap AXS than ever ride RED. It’s going to take on an 800-pound gorilla called Shimano Ultegra Di2 in the ultra-hot $5000 bike category. Is it up to the task? SRAM’s Road Category Manager, Paul Kantor thinks so, “That’s a Pepsi Challenge we’d love to take.” Game on. 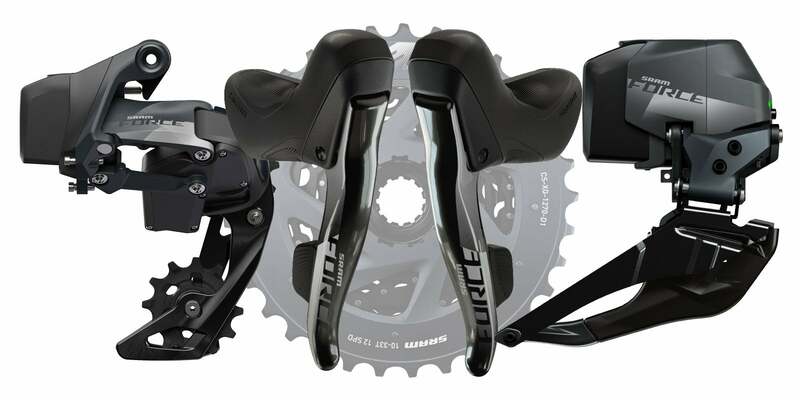 • SRAM Force eTap AXS brings all the functionality of Red eTap AXS to a lower price point. • It uses the same 10t sprocket and XDR rear hub driver Red eTap AXS uses to create such wide 12 speed gear ranges called X-Range. • The major differences between RED and Force eTap AXS is simply the materials used to construct the group. 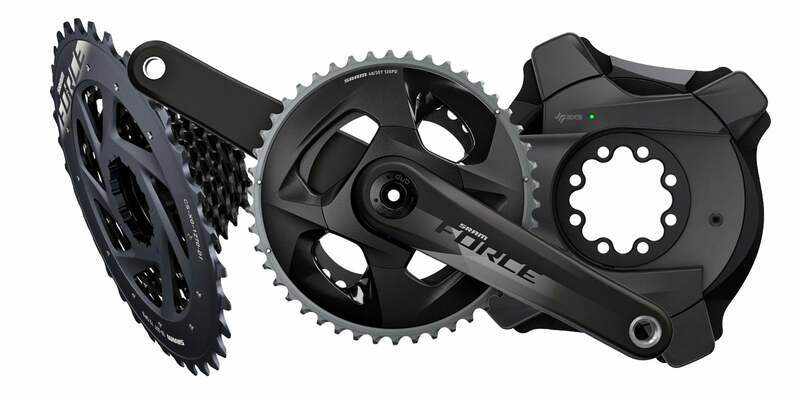 • Force and RED eTap AXS part are interchangeable, and work with other AXS components like Eagle eTap AXS and the Rock Shox eTap dropper. • Take the deep dive on Red eTap AXS right here. 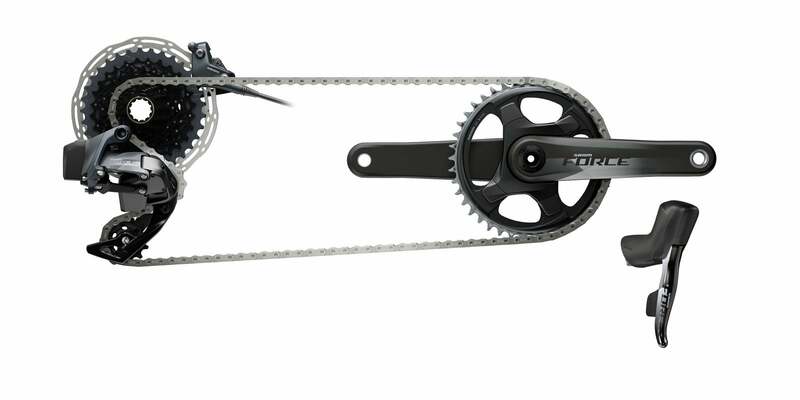 • Don’t expect SRAM to ever make a mechanical 12 speed group. Its focus is eventually bringing electronic shifting to the $2000 bike. 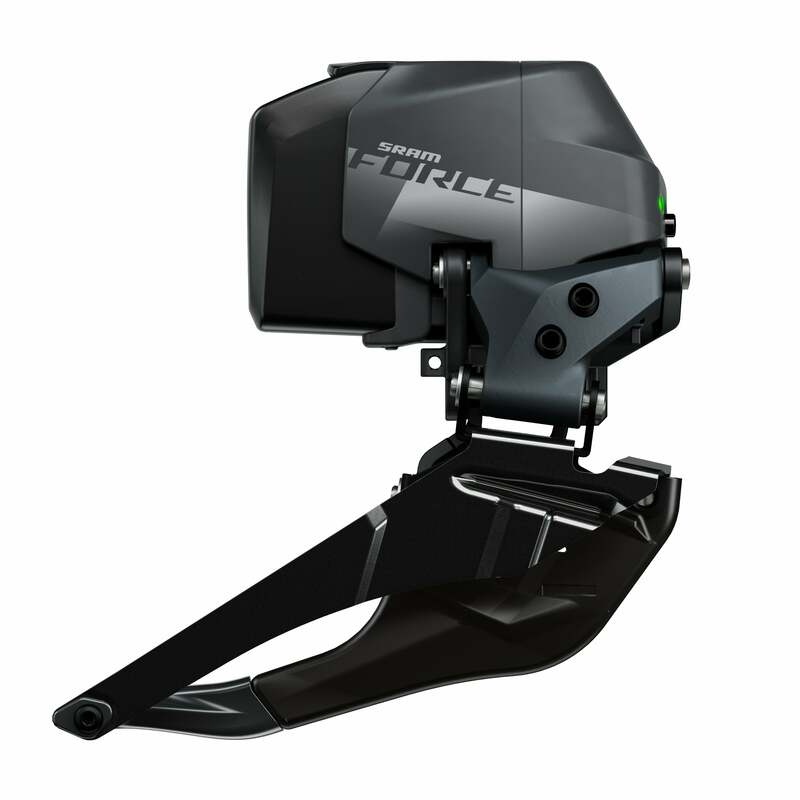 So what took SRAM so long to electrify Force? The moment SRAM launched the first RED eTap group back in 2015, it already had so many updates it wanted to do, it decided to wait until next generation RED eTap AXS 12 speed to get Force eTap online. Much like Shimano’s Ultegra Di2 and Dura-Ace Di2, rather than talk about the similarities between RED and Force eTap AXS, it’s easier to talk about the differences. Functionally there are essentially no differences. Instead the differences come in materials, the chain uses the same Flat Top design, but the pins are solid, not hollow. Instead of being fully machined, the 12 speed cassette is pinned. 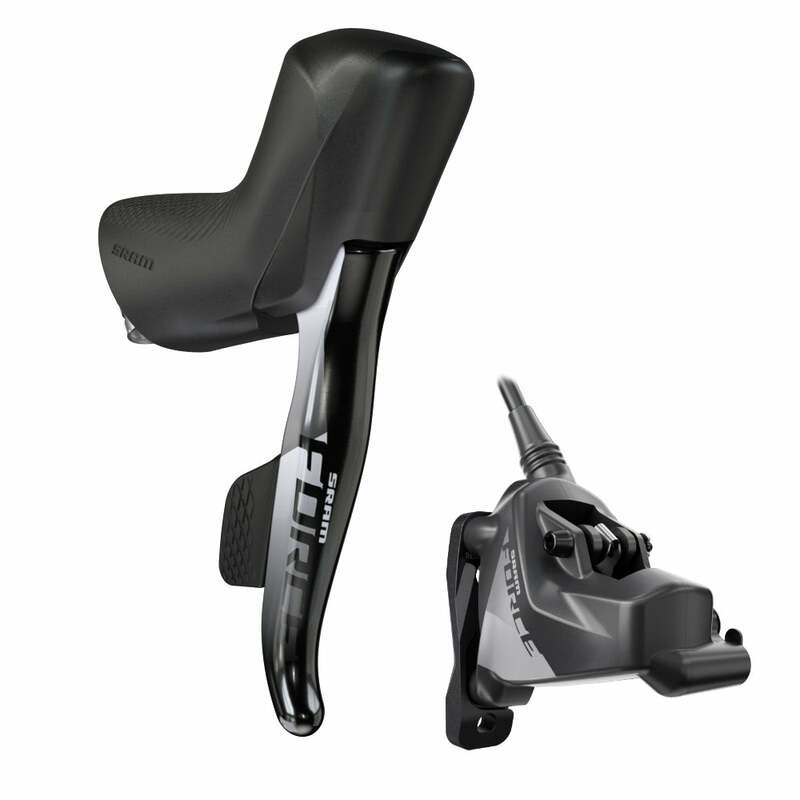 The cassette is also a very stealthy black and compatible with RED eTap AXS. The Force levers are identical in form and function, but have just one auxiliary port, not two, which just means you can’t run sprint and climbing blips at the same time, which is a rare set up any way. Instead of three chan ring options the group has just two – 48/35 and 46/33 – along with three cassettes, 10-26, 10-28 and 10-33. 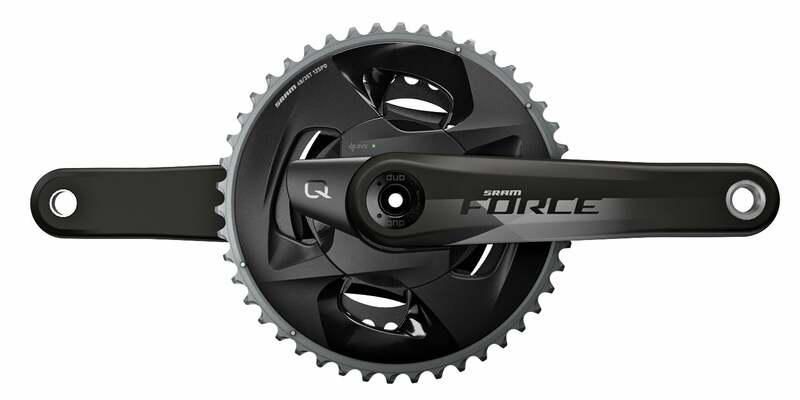 Force eTap AXS’s power solution is different too, instead of being integrated into the chain rings to save weight, its Quarq D-Zero power meter is spider based, which may be seen as a benefit to some riders concerned about chain ring wear. Big picture, Force eTap AXS is 12 speed, available as a 1x setup, a 2x set up, drop bar or TT shifters, and with rim or hydraulic braking, although SRAM did tell us that this is likely the last rim brake eTap group it will make. The brake calipers, rim and hydro, are hold overs from previous Force mechanical groups. Force shifts just as fast as big brother, RED eTap AXS, and with the same AXS app, the shifting can be customized from button inputs to compensating and sequential shifting. 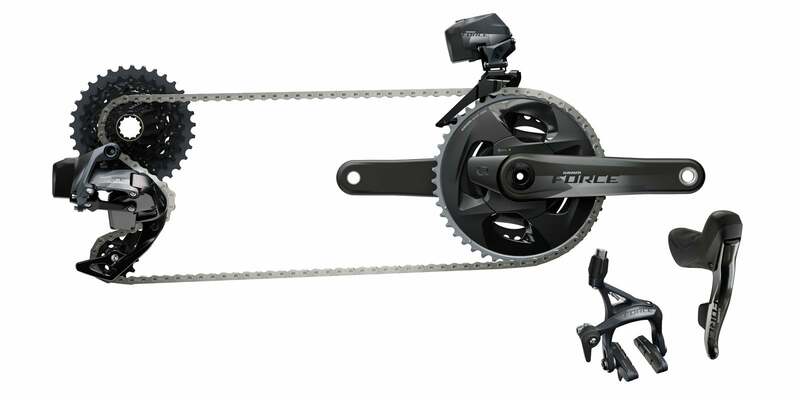 Force levers can be used to drive a Red derailleurs or the Eagle AXS drive train for massive drop bar gear range. Rear derailleur also has the super trick fluid damper to manage chain tension over rough road, gravel and ‘cross courses. It also uses the same derailleur across all available cassettes. Much like RED eTap AXS’s coming out party, expect to see Force eTap AXS spec’d on a host of bikes from day one and even available in the after market immediately, like right now. Call your shop, they should have a bike or two with it and be able to get you a group if you want. While functionally the difference between RED and Force eTap AXS appears vanishingly small, how big a difference do the materials make on the scale and at the cash register? Let’s compare a 2x hydraulic disc brake road group without a power meter. For RED, you’ll pay $3648 for the group and hit 2518 grams on the scale. The equivalent Force group is $2678 and weighs 2812 grams. With RED, you’ll pay an extra $970 to lose 294 grams. Check below for the rest of Force eTap AXS prices and weights.